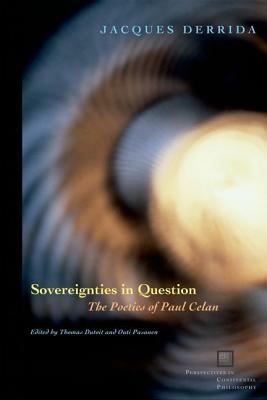 Fordham University Press, 9780823224388, 209pp. - The Majesty of the Present: Reading Celan's "The Meridian"
and for the irreducibly other. I must carry you," which sounds throughout the book's final essay like a refrain. Only two of the texts in this volume do not appear here in English for the first time. Of these, Schibboleth has been entirely retranslated and has been set following Derrida's own instructions for publication in French; "A Self-Unsealing Poetic Text" was substantially rewritten by Derrida himself and basically appears here as the translation of a new text. Jacques Derrida's most recent books in English translation include Counterpath: Traveling with Jacques Derrida (with Catherine Malabou). He died in Paris on October 8, 2004. Thomas Dutoit teaches at the Universit de Paris 7. He translated Aporias and edited On the Name, both by Jacques Derrida. The late JACQUES DERRIDA was the single most influential voice in European philosophy of the last quarter of the twentieth century. His The Animal That Therefore I Am, Sovereignties in Question, and Deconstruction in a Nutshell have been published by Fordham University Press. Thomas Dutoit teaches at the Universite de Paris 7. He has translated Aporias and edited On the Name, both by Jacques Derrida. OUTI PASANEN has translated Jacques Derrida's work into Finnish.